Runoff and sediment yield modeling is important in the watershed to alleviate soil erosion and reservoir sedimentation. This paper presents runoff and sediment yield modeling of Kesem dam watershed, which has a drainage area of 2660 km2. Soil and Water Assessment Tool (SWAT, version 2009) integrated with ArcGIS software (version 9.3) was used to simulate the stream flow and sediment concentration of Kesem dam watershed situated in Awash River basin for the period from 1994 to 2010. The model was calibrated manually by adjusting sensitive parameters using observed data from 2001 to 2006, and validation was done using observed data from 2007 to 2010. The model performance was checked by statistical model performance evaluators such as the coefficient of determination (R2), Nash–Sutcliffe model efficiency and Percent bias and it shows that the model has a high potential in the estimation of runoff and sediment yield. The test of the model SWAT by simulating the streamflow and sediment concentration was satisfactory. From the generated spatial distribution of runoff and Sediment yield of the Kesem dam watershed, subbasins 12 and 13 were high runoff and sediment yielding sub-basins among the 41 sub-basins. The outputs of this study will be used by water resource managers and decision makers to conserve soil and water in the sub-watershed levels. Runoff and sediment yield modeling is important in the watershed [1, 2, 3]. Even though watershed has only one outlet point, it is characterized by different socio-economic activities, spatial, hydrological and climatic variability. Spatial and temporal variability have the visible change in the quantity of runoff decreased or increases with the size of watershed and shape [4, 5, 6, 7]. Modeling the hydrological process such as runoff and sediment yield of the watershed is useful to manage the natural resources. In turn, this can be helped for sustainable soil and water management, which are key resources of the community living in the watershed. During rainfall, part of the precipitation is intercepted  or infiltrates into the ground, and the remainder flows over the land surface as runoff run to the nearest stream or river. Runoff has different characteristics  and affected by natural and man-made activities. For instance, in paved areas, storm-water runoff is much larger than non-paved areas. As runoff flows over the land surface, it picks up and transports potential pollutants and necessary soil materials . Sometimes runoff occurs based on the degree of soil infiltration capacity and action of water force the soil erosion event will appear. Erosion rates are frequently measured in small fractional-hectare plots and the erosion agent [11, 12] and affected by different factors, for example, rainfall intensity [13, 14]; these factors have a dynamic role in the erosional behavior of soil [15, 16]. Soil erosion accelerated by human activity and has a serious ecological impact that costs a nation due to on-site effects such as soil nutrient and economic loss and offsite effects due to reservoir sedimentation . Additionally, in the downstream irrigation and water resources project damages . Furthermore, erosion also reduces the products of crops which resulting from soil fertility reduction [19, 20, 21, 22], flood hazards, and this, further, has further problems of water availability, water quality, food security, and food supply [23, 24]. At farming land, erosion problem initiated by tillage practice in which the soil surface destructed , overgrazing [26, 27, 28], deforestation and poor land management practice; especially on slope land. Erosion and sedimentation are a sequential phenomenon first occurred in the upstream of the watershed. Then, due to one of soil erosion agent that is water, after passing the erosion process, it is deposited at plain or mouth of the stream channels as sedimentation. They affect sustainable water resource planning and management and reservoir life . Runoff and sediment yield can be estimated using different watershed models [3, 30, 31, 32, 33, 34, 35, 36]. Out of several runoff and sediment yield simulating models Soil and Water Assessment Tool (SWAT) has been used to predict runoff and sediment yield [37, 38], SWAT efficiency was good with streamflow prediction [39, 40]. A lot of studies have been reported using SWAT to predict surface runoff, soil erosion, sediment yield and assessment of best management practices [41, 42, 43, 44]. Researchers reported that in Ethiopia the model was calibrated and validated with good performance on the hydrological process and management practices [45, 46, 47, 48, 49, 50, 51, 52, 53, 54].Therefore, in this paper, SWAT was used to accomplish the general objectives of this study which is modeling of runoff and sediment yield by SWAT model of Kesem dam watershed and the specific objectives (1) to test the reliability of the model SWAT by simulating the streamflow and sediment concentration in Kesem dam watershed and (2) to predict and generate the spatial distribution of runoff and sediment yield in each sub-basin of Kesem dam watershed. The study was performed in the Kesem dam watershed, which is the part of the Awash River basin. Kesem River is passing through Kesem dam watershed; before draining into the Awash River it has been contributing water for Kesem irrigation project available lower of Kesem dam. The Kesem dam watershed, located between latitudes around 8°50′ and 9°20′N and longitudes 39°00′ and 40°00′E. It has a watershed drainage area of about 2660 km2 up to the outlet point of the Kesem dam (Fig. 1). The climate of the study area varies from arid in the lower altitudes to semi-arid in the high altitudes of the watershed. The rainfall distribution of the Kesem dam watershed is low around the outlet of the watershed as compared with the middle and the highest altitude of the watershed (high rainfall) . On the other hand, the Kesem watershed has to mean maximum temperature of 38 °C and mean minimum temperature of 15 °C. However, the weather condition upstream of the watershed is cool and moist with elevation variation between 1500 and 3488 m above mean sea level . The Kesem Dam and its reservoir are located on the Kesem river channel; it is located at the southern end of the Afar depression (rift) in Afar regional state of Ethiopia. It lies between the UTM 37 zone coordinates of 580,000–608,000 mE and 9,810,000–1,020,000 mN. For proper implementation of this study, Geographic Information system (GIS) software, physically based watershed model SWAT and other data processing software’s has been used. Since the model is physically based , the surface properties such as digital elevation model (DEM), stream network, digital soil map, digital land use and land cover map, climatic and hydrological input data of study watershed were used. The DEM of study area (Fig. 2a) was downloaded from ASTER GDEM website (http://gdem.ersdac.jspacesystems.or.jp/) a resolution of 30 m by 30 m. Using the geographic positioning system (GPS) reading of the main outlet point (Latitude 9.15°N, Longitude 39.78°E) of the Kesem dam watershed; watershed boundary, stream network and drainage pattern of the watershed were developed (Fig. 3). In addition, from DEM, the relevant flow parameters flow accumulation, flow direction and slope were derived. 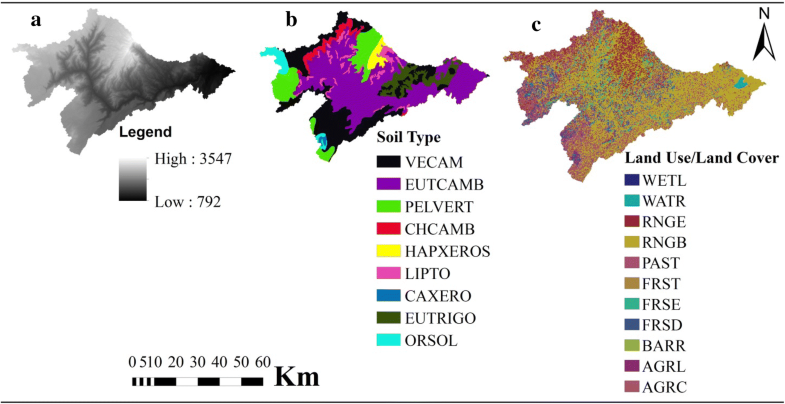 The other spatial model input data were land use and land cover, soil map of the study area. The land use and land cover are one of the most important factors that affect runoff, evapotranspiration and surface erosion in any watershed. The digital 2008 land use and land cover and soil map of the Kesem dam watershed was obtained from the Ministry of Agriculture of Ethiopia. 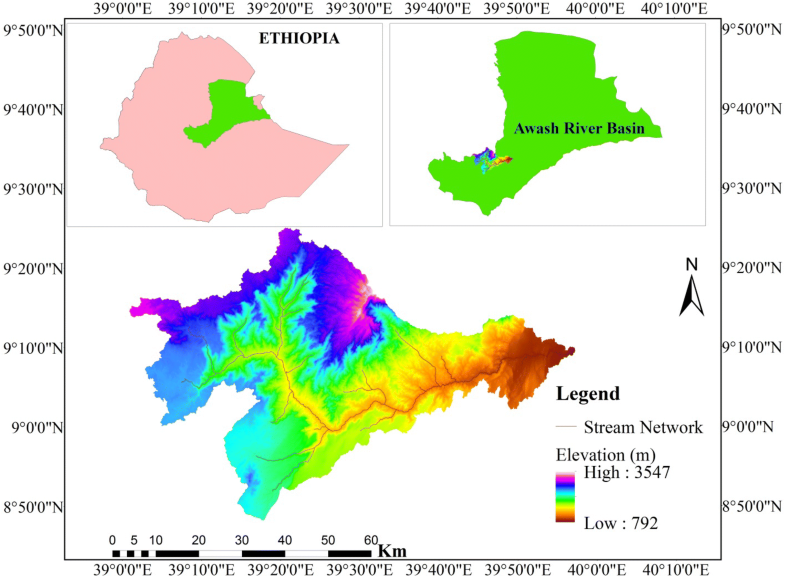 On the basis of land use and land cover map of Ethiopia, the extracted land use and land cover (LU/LC) map of the study watershed was reclassified using the SWAT model in order to correspond with the parameters in the SWAT database (Fig. 2c). In the same manner, the soil map of the study watershed also reclassified in order to correspond with the parameters in the SWAT user soil database (Fig. 2b). For successful reclassification, a look-up Table (4-letter SWAT code for LU/LC in DBF file format,) and soil look-up table in text file format was prepared. After LU/LC and the soil SWAT code is assigned to all map categories, the estimated values of the area-percent (%) coverage are provided below in Table 1. These procedures were applied to determine the hydrologic parameters of each land and soil category simulated within each sub-watershed. The SWAT model requires different soil physical and chemical properties such as soil texture, available water content, hydraulic conductivity, bulk density and organic carbon content for different layers of soil. In this particular study, the soil properties of the Kesem dam watershed were taken from Kesem dam and irrigation project of Kesem watershed design document of soil laboratory tests . Hydro-meteorological data is needed by the SWAT model to simulate the hydrological behavior of the watershed. The meteorological data required for this study were obtained from the national meteorological agency of Ethiopia in the time range from 1994 to 2010 for this study. The meteorological data collected daily value for precipitation, maximum and minimum air temperature, wind speed, relative humidity and the sunshine (converted to solar radiation). With the availability of data distribution of each metrological station in the study area, only six stations selected for this study those data recorded is better as compared with the others (Table 2). The hydrological data were required to identify the most significant sensitive parameters for the calibration and validation model procedures. 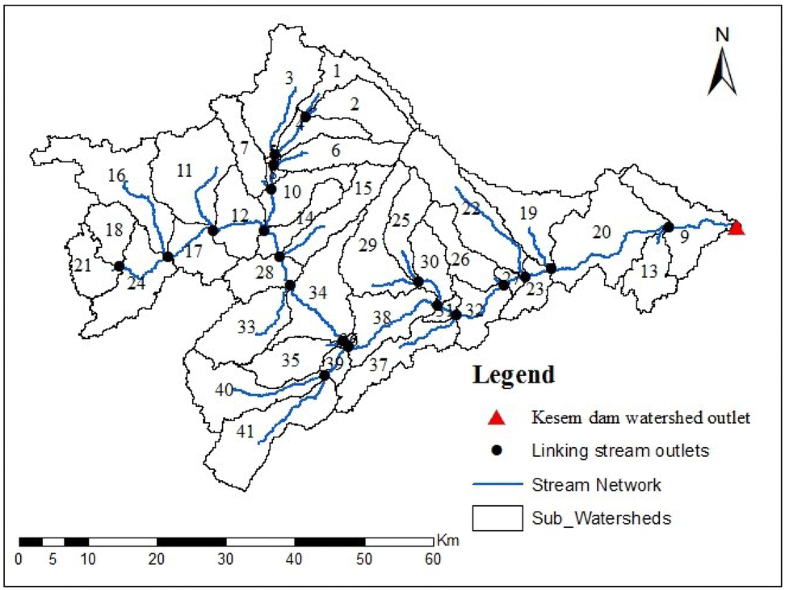 The streamflow data were collected from Ministry of Water, Irrigation and Electricity from the hydrology and water quality directorate department in the time series data (1994–2010) for Kesem River which crosses the Kesem Dam watershed at Awara Melka gauging station. Due to discontinuous time series sediment record data measured by Water, Irrigation and Electricity, using stream flow and measured suspended sediment data, sediment load data was generated in the continuous time step, by developing sediment rating curve. Modeling of runoff and sediment yield of the Kesem Dam watershed was built using SWAT model. SWAT  is the interface of GIS software and has been using readily available GIS input data. The model was designed using the Kesem Dam watershed extracted and properly projected data, such as DEM, 2008 LU/LC, soil map and weather data. 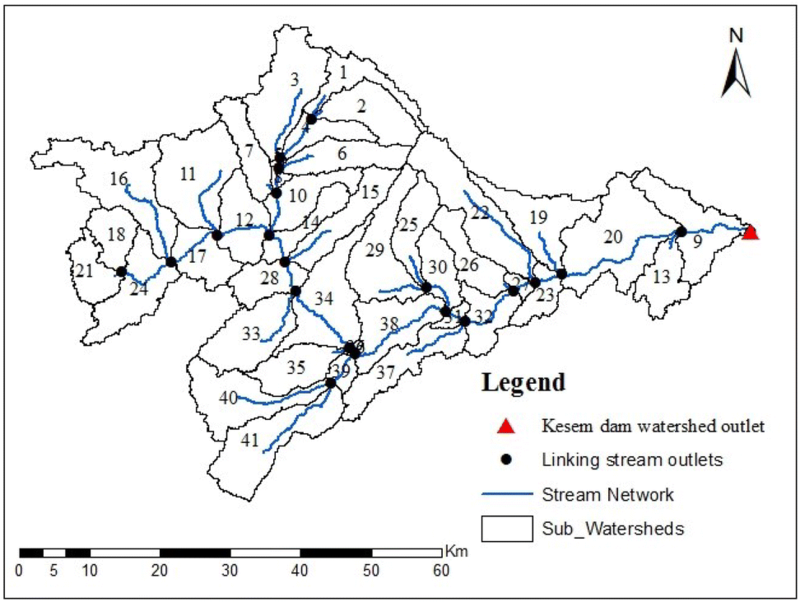 The first step in the SWAT model setup was watershed delineation, sub-watershed  and naturally existing stream network determination using the Kesem Dam watershed DEM (Fig. 2a). Next, the study watershed was divided into sub-watersheds based on the concept of flow direction and accumulation; and sub-watersheds were further subdivided into smallest unit called HRUs which consist of unique combinations of homogeneous soil and land use properties and slope range [42, 57]. The cyclic motion of water in nature is determined by the hydrologic cycle and it has been simulated in SWAT using the water balance equation defined below [56, 57]. where SWt is final soil water content (mm), SWo is initial soil water content (mm), Rday is the precipitation (mm), Qsurf is the surface runoff (mm), Wseep is the water entering vadose zone (mm), Ea is the evapotranspiration (mm) and Qgw is the return flow (mm) and t is time (days). where 11.8 is the unit conversion factor, Sed is the sediment yield in ton per day (ton/day), Qsurf is the surface runoff volume (mm/ha), qPeak is peak runoff rate in m3/s, Ahru is the area of HRU (ha), KUSLE is the soil erodibility factor, CUSLE is cover and management factor, PUSLE is support practice factor, LS is topographic factor, CFRG is course fragment factor. Based on the default values of model parameters, the sensitive input parameters for both stream flow and sediment yield was identified and calibrated manually  at the dam site gaging station. The model was calibrated by changing the stream flow and sediment yield parameters until the model simulation results were fallen in the acceptable range as per the model performance evaluation measures. The model performance was checked based on visual inspections and statistical model evaluators defined in Sect. 2.5 below. The calibration was done first for streamflow, followed by sediment yield. The calibrated parameters of the model were then validated using an independent data set of streamflow and sediment yield data out of the range period assigned during the calibration in monthly time basis. In order to evaluate the performance of the model such as its quality and reliability of prediction compared to the observed values the methods for goodness-of-fit measures of model predictions used during the calibration and validation periods. These numerical model performance measures are coefficient of determination (R2), Nash-Sutcliffe simulation efficiency (NSE)  and Percent bias (PBIAS) (Fig. 4). The coefficient of determination (R2), it is the square of the Pearson product moment correlation coefficient ; which describes the proportion of the total variance in the observed data; i.e. explained by the model. The value of R2 greater than 0.6 (Fig. 4) and close to one is the higher of the agreement between the simulated (flows and sediment load) with the observed (flows and sediment load). where Q i ob is observed value (flow in m3/s or sediment in tons), Q mean ob is the average observed of n value, Q i sim simulated value (flow in m3/s or sediment in tons), Q mean sim averaged simulated of n value and n is the number of observations. Nash–Sutcliffe efficiency (NSE): NSE is a normalized statistic that determines the relative magnitude of the residual variance compared to the measured data variance. NSE indicates that the plot of observed values with simulated values of the data fits the 1:1 line. NSE ranges between − ∞ and 1 (1 inclusive), NSE > 0.5 is a good model performance (Fig. 4); NSE equal to 1 is being the optimal value. Percent bias (PBIAS) as introduced by Moriasi et al. and measures the average tendency of the simulated data to be larger or smaller than their observed data . The PBIAS low-magnitude values show accurate model simulation. A positive value of PBIAS indicates model is an underestimation and negative values indicate model is overestimation bias . The first step in the calibration and validation process in the SWAT model is the identification of the most sensitive parameters for a given watershed that have a significant impact on specific model outputs such as streamflow and sediment yields . 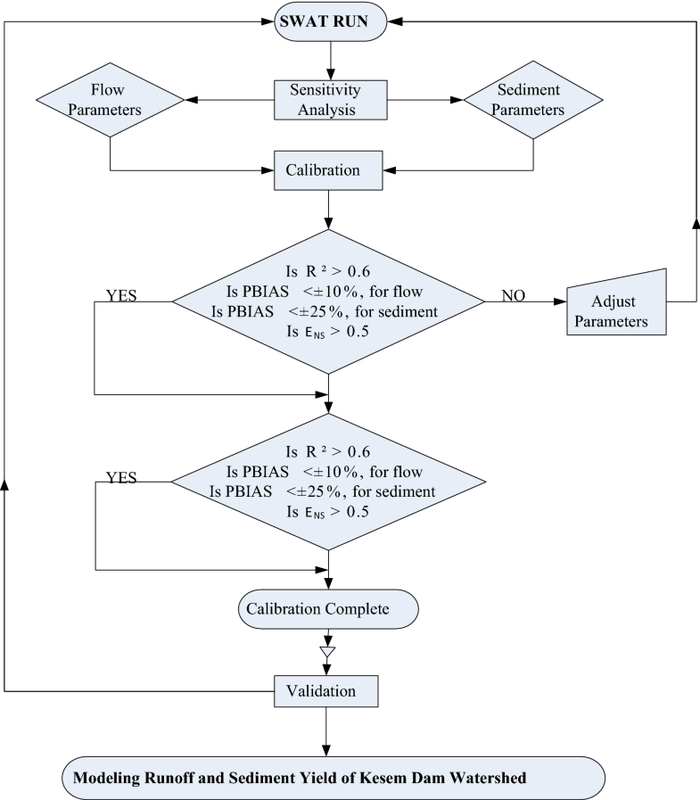 Sensitivity analysis was done and it was found that the Available water capacity (Sol_Awc) was the most sensitive parameter, followed by the base flow Soil depth (Sol_Z) and Plant evaporation compensation factor (Epco) reported as a medium sensitive parameter in the stream flow parameters (Table 3) and parameters such as USLE_P support practice factor and USLE_C cover factor were the most sensitive parameters in the sediment yields (Table 5) in the Kesem dam watershed. Hence, these most significant parameters were considered for further model calibration and validation (Tables 4 and 5). The model calibration was run for a period of 7 years from Jan/1/2000 to Dec/31/2006. From these periods of simulation, the first year (2000) was set as a warm-up period. Therefore, the calibration performed for 6 years from Jan/1/2001 to Dec/31/2006 for streamflow and sediment yields of the Kesem dam watershed. The calibration process was done manually until the acceptable agreement happens between observed and simulated data . This activity determined in the monthly time basis. Moreover, the fit between observed and simulated streamflow and sediment yield data was checked by statistical techniques provided below in Table 6. Streamflow and sediment yield hydrographs were developed to compare observed and simulated streamflow and sediment yield values for the calibration periods in monthly time step (Figs. 5, 6). Statistical model performance evaluator of calibration result shows a good agreement between the observed and simulated streamflow and sediment yield parameters  (Table 6) and the model recommended for the monthly time basis . Moreover, previously SWAT was not applied in the study area; following this fact, the calibrated results indicate that the model recommended for predicting watershed process of the Kesem dam watershed. As indicated in Table 6, the model slightly overestimated the simulated streamflow result in some months of the years during the calibration period and underestimated the sediment yield simulation results. This was as a result of high rainfall and the occurrence of runoff, which has a high record period. But the time series trend of the gauged flow was well fitted for monthly time steps. Model validation was carried out over a 4 year period (Jan/1/2007 to Dec/31/2010) for both streamflow and sediment yield parameters. An agreement between measured values (streamflow and sediment concentration) and simulated outputs (streamflow and sediment concentration) on monthly time steps as shown by R2, ENS, and PBIAS (Table 6), the model parameters represent the processes happen in the Kesem dam watershed. Figures 7 and 8 clearly show a reasonably good agreement between observed and simulated streamflow and sediment yield hydrographs for monthly time steps during the validation period. The long-term results of the flow a seasonal variation (Fig. 9) show that there was a good agreement between observed and simulated average values of streamflow; even though the model underestimates streamflow from June to middle August of the study period. This shows that there was a high measured flow value which greater than the simulated results. The peak, the average flow volume, at Kesem Dam sites was 246.98 mm3 and 261.20 mm3 of simulated and observed respectively. In addition, the watershed average annual runoff was estimated to 543.67 mm (Appendix). Runoff and sediment yield of each sub-basin was not uniform. This was as a result of rainfall distribution and its intensity . In fact, only rainfall amount and its distribution have not impact on runoff and erosion rather the intensity . Actually, good LU/LC cover has positive effects on the reduction of runoff and sediment yield. Several studies prevail, that LU/LC can be controlled erosion by covering the soil surface by the canopy and reduce the mechanical action happen at the soil surface by intercepting the raindrop . In the Kesem Dam watershed, the most sediment yielding sub-basins were 2, 4, 9, 12, 13, 20, 23, 27 and 36 (Fig. 10c). These sub-basins were covered most areas by range-brush lands followed by agricultural lands close grown crops (Fig. 2c and Table 1). The slope of these high sediment yielding sub-basins were > 15% slope area coverage. The runoff and sediment yield distribution, for instance, sub-basins 12 and 13 were high (Fig. 10b, c) and characterized by maximum rainfall distribution (Fig. 10a). The least sediment yielding sub-basins were 1, 16, 18 and 21 (Fig. 10c). The slope of these sub-basins were less than 15%, although they had the slope between 7 and 15% they deliver least sediment may be due to well-covered land use/cover. As shown in Fig. 11, precipitation and runoff alone have no impact on sediment yield. For instance, in sub-basins 1, 16, 18 and 21 there was high precipitation and runoff but less sediment yield. This is maybe the response of LU/LC, soil resistance to erosion, slope (Fig. 12) and other management practice found in the watershed . Figure 12 shows that the relationship between slope and sediment yield had a direct relation in some sub-basins; example 12, 13, 23, 27 and 36 produced high sediment yields. But in the other sub-basins, it is inverse relation, i.e. high slope and low sediment and vice versa, this might be due to the LU/LC, soil resistance, and rainfall intensity. For instance, Fig. 12, sub-basins 2, 10, 22, 26, 30 and 41 shows the inverse relation. In general, sub-basins that produce a high sediment yield in their greater slope and studies reported that when slope increased runoff decreased . 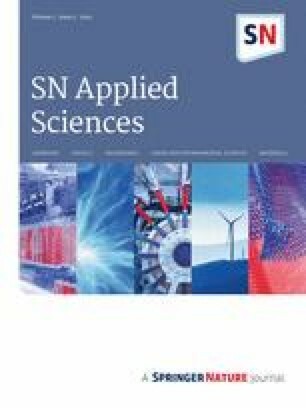 In this study, the SWAT model was applied and the results obtained suggest that the model is efficient in simulating streamflow and sediment concentration. As the model performance evaluation statistics shows, the model calibration and validation results of streamflow and sediment yield were in a good agreement with measured values. For instance, the coefficient of determination (R2) of 0.87, Nash–Sutcliffe Efficiency (NSE) of 0.84 and PBIAS of − 8.25 for stream flows was obtained for the calibration period (2001–2006). And; also R2 of 0.85, NSE of 0.84 and PBIAS of 7.29 for sediment yield for the calibration period (2001–2006). On the other hand, during the validation period (2001–2006) the results of R2, NSE and PBIAS are respectively 0.86, 0.87 and 4.03 for stream flow and also R2, NSE and PBIAS are respectively 0.77, 0.76 and 14.4 for sediment sediment yields. The spatial distributions of the runoff and sediment yield showed sub-basin 12 and 13 have high runoff rates and sediment yields among the 41 sub-basins generated by the SWAT model of the Kasem dam watershed that was observed during the heavy rainfall and land use/land cover. Subbasin 12 (812.4 mm and 24.08 t/ha) and 13 (866 mm and 28.37 t/ha) are in the highest runoff and sediment yield distributions. The water reservoir and other infrastructures in these sub-basin and the whole Kesem dam watershed alter due to the critical sediment yields and therefore, the study watershed needs conservation measures for the future sustainable uses and infrastructure development. We gratefully acknowledge of Ministry of Water, Irrigation and Electricity, National meteorological agency (NMA) and Ministry of Agriculture of Ethiopia for their all rounded support and cooperation in availing the necessary data. The authors also would like to express their sincere gratitude to anonymous reviewers and editors for their constructive comments and suggestions through scientific discussions, which really helped in the revision of the manuscript. The authors declare that there are no conflict of interest associated in this manuscript.